This is a square Hubbard’s Bone Base porcelain sign. This particular Hubbard Bone Base sign is white with blue print. 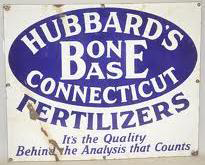 It reads, “Hubbard’s Bone Base Fertilizers, Connecticut, It’s the Quality Behind The Analysis That Counts” and features a blue oval in the center.